The way our plan works. Once you purchase your sprinkler plan you can always upgrade to another one. There would be a $30.00 admin. fee for all upgrades. 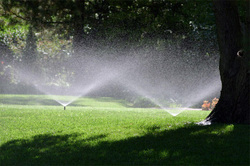 If you do not have a sprinkler system then we would draw you up a proposal plan and present it to you after a few days. If you choose us to install your sprinkler system we will give you Our Yearly Plan for free for the first year. That is our way of saying thanks for using us as your sprinkler man! Our Maintenance Service Plan consists of 4 options. Upon requests of many of our customers we are now offering 4 Maintenance Service Plans to better fit your needs. We hope that you will find that enrolling in our program wil make life easier for you and less work. We accept major credit cards. Winterization Plan@ $99.00 OPTION#1 This plan is only serviced in the Winter months November, December, January, February,the only thing we do during these months with this plan is check your backflow drain all water out insulate the system for winter add a ball valve if needed and shut it down . ( A 24X24 GREEN INSULATION BAG IS INCLUDED). Regular service call price plus parts will be schedule for customers that already have insullation bags. Spring Fever Plan @199.00 OPTION#2- This plan begins in March and goes into May. We test your system and replace all broken sprinkler heads and make adjustments. There is a 3 call limit with this plan. We come out make adjustments check your system and fix all sprinkler heads. There is a 3 call limit with this plan. We will adjusts the heads to where we think it is adequate. Parts are not covered in this plan.